Right throughout the course of Test history, there have been certain fast bowlers who find their mojo all of a sudden before proceeding to destroy batting lineups. From the fiery Fred Trueman and irresistible Dennis Lillee to the intimidating Curtly Ambrose and turbo-charged Dale Steyn, the traditional format is replete with numerous such vicious spells. 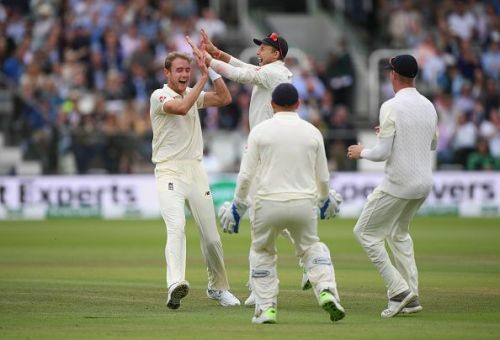 While James Anderson may possess a much better overall skill-set, Stuart Broad has the uncanny propensity to deliver seething spells from nowhere. Although he may fall short of the aforementioned legends consistency-wise, Broad certainly belongs to elite category when it comes to unleashing untamed bursts of energy. India's second innings at Lord's played witness to one such manic spells from Broad. Considering the ineptitude of the visitors' batting lineup, the four-wicket burst may not rank in the league of Trent Bridge 2015 or Johannesburg 2016. But the domineering performance was once again a fierce reminder from one of the best fast bowlers in the current era. India began their second innings at a massive deficit of 289 runs. Nowhere to hide, the openers walked gingerly into the crease as if aware of the grim fate that was to await them. James Anderson aggravated their woes by dismissing both Murali Vijay and KL Rahul in quick succession. In the process, the 36-year old also completed his 100th scalp at Lord's. At the start of the second session on the fourth day's play, Cheteshwar Pujara and Ajinkya Rahane attempted to keep the in-form England seamers at bay. The former, in particular, looked quite solid. When it seemed like there would be a period of relative calm, Broad got the latter to drive loosely away from his body. The wicket was as much a product of the perfect set-up as much as it was of the batsman's incompetence. 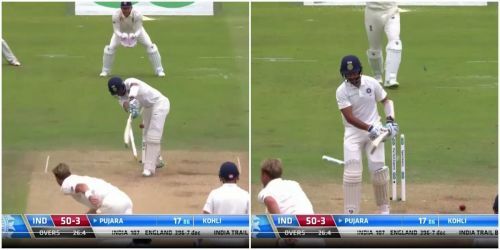 After being run-out in the first innings, Pujara received a truly unplayable delivery from Broad in the second essay. He had battled defiantly for over 100 minutes before the tall seamer got one to jag back in without any notice. As the stumps lay splattered on the ground, India's number three started a sombre walk back. Very much in the middle of what was one of his trademark intense spells, Broad pierced the final nail in India's coffin by procuring the scalp of Virat Kohli. The Indian skipper, who was batting with a stiff back, was pushed further by a delivery which rose sharply. Even DRS could not come to his rescue as debutant Ollie Pope pouched the glove-tinged opportunity. Broad trapped Dinesh Karthik in front off the very next delivery to leave India reeling at 61/6. With the wicket-keeper batsman's shoddy technique, this was a just matter of when. The ball moved inwards after pitching on its seam and completely caught the right-hander off guard. The partisan Lord's crowd sensed a third career hat-trick for Broad. However, all-rounder Ravichandran Ashwin breathed a sigh of relief as the ball moved too enough and escaped to the boundary. After watching his fellow bowlers take all the accolades in the series thus far, Broad had served a timely reminder of his longstanding ability to produce stirring spells. It might not have been a hat-trick or a five-wicket haul. But the 4/44 certainly played a role in hastening India's end. Perhaps, it could also be a warning sign of things to come as the action moves to Trent Bridge for the third Test.